1. Colourful patterns. Purchase several different colors of disposable drinking glasses. Use them to create a series that children can complete. For example, you can set a blue glass, a red glass, and a yellow glass in a row on the floor. Add a blue glass at the end of the row. 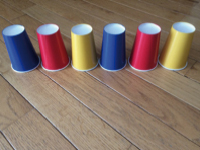 Encourage children to try to identify the core of the pattern (blue, red, yellow) and to continue it to create a long row of glasses. Invite older children to create their own original series that their friends can have fun completing. 2. Simplified dice rolling. Often, young children have trouble rolling dice when playing board games. 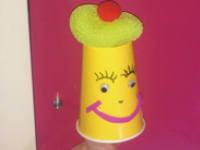 To help them, hand them a sturdy disposable drinking glass, preferably one with fun designs. Show them how they can drop the dice inside the glass and place one hand on top of the opening and the other hand under the glass to shake it before emptying the glass onto the floor or playing surface. As soon as the glass is damaged, simply replace it. 3. Cardboard constructions. Offer several different sizes of disposable drinking glasses in your sandbox. Encourage children to use them to create roads, towers, etc. Wet the sand just a little and let them fill the glasses with it. They can overturn the glasses to create sand structures they can line up or stack. If they have difficulty removing the compacted sand, show them how they can tear the cardboard surrounding the shapes. 4. Tiny plantations. Disposable glasses are perfect for growing, among other things, beans, chives, or grass with the children in your group. Their little hands can easily grab hold of the glasses, making it easy to fill them with soil and plant seeds. Choose glasses with bright colors or pretty designs; they will instantly cheer up your décor! 5. Paint distributors. Before your next painting activity, purchase disposable drinking glasses that correspond to the paint colors you will be offering. Fill a blue glass with blue paint, a yellow glass with yellow paint, etc. This method will help children quickly recognize and find the paint color they wish to use. At the end of the activity, simply discard the glasses for a quick and easy cleanup! 6. Color recognition. 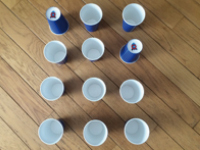 During an activity involving blocks, give each child a red drinking glass, a blue drinking glass, a yellow drinking glass, and a green drinking glass. Encourage them to fill each of the glasses with blocks of the corresponding color. Name the different colors together as they complete this task. Once their four glasses are filled with blocks, invite children to use the blocks for colourful constructions. This method will facilitate the distribution and sharing of blocks while helping children practice their color recognition and association skills. 7. Simple bracelets. Purchase colourful disposable drinking glasses or drinking glasses with fun designs. Let children choose two or three glasses each. Using scissors, cut a strip of cardboard near the bottom of each glass. Each strip will have a slit where you cut into the edge of the glass. 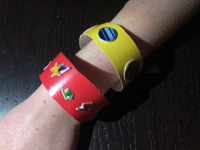 Show children how they can gently open the slit on each bracelet to slide them onto their arm. They will enjoy decorating their bracelets with stickers or gluing gems and glitter on them. 8. Fist puppets. Purchase disposable drinking glasses in which children will easily be able to insert their fist. Give each child two glasses. Invite them to draw a face on each upside down glass. Encourage them to glue pieces of yarn or strips of paper on what would normally be the bottom of the glasses to represent hair. You can also provide wiggly eyes they can glue in place to make their characters even sillier. Show them how they can place a fist inside each puppet to bring them to life. They will have fun inventing various scenarios with their fist puppets. You may choose to have them use the puppets to prepare a puppet show that can be presented at the end of the day or videotaped and sent to parents via email. 9. Miniature homes. Help children cut a tiny opening in several disposable drinking glasses, near the edge. You can make round, rectangular, and triangular openings. Each opening will represent a door. 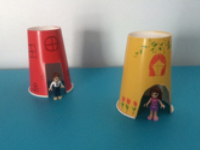 Encourage children to decorate the upside down glasses to turn them into miniature homes. Provide crayons, markers, glitter glue, stickers, etc. When they are ready, have fun placing the miniature homes throughout the daycare to create a village that is ready to welcome tiny figurines. Children will play with them for hours! The best part: they can reinvent the village over and over again. 10. Three-dimensional memory game. Purchase a package of sturdy disposable drinking glasses. Under each glass, place a sticker, making sure to use pairs of identical stickers (two heart-shaped stickers, two car-shaped stickers, etc.). Arrange the glasses in rows on the ground and sit around them with your group. Children take turns lifting two glasses and naming the items represented by the stickers. If a child finds two identical stickers, let him keep the glasses. If the stickers are different, the child must replace the glasses where they were originally and his/her turn is over.